As an animal physiotherapist, arthritis in dogs is one of the most common problems I see. Arthritis doesn’t discriminate. Dogs of all shapes, sizes, breeds and age groups can be affected. For many it is as a result of an injury or surgery to a joint. For others it can be through prolonged wear and tear. In this 2 part blog post I will discuss some tips you can put into action straight away to maximise your dog’s quality of life and longevity when they have arthritis, and how physiotherapy can help them feel and move better. Arthritis is a progressive degenerative disease affecting the joints of dogs, causing swelling, pain inflammation. This can be debilitating to dogs if left untreated. However if we can detect signs of it occurring early on, we can take steps to make sure our pets live long happy, healthy and pain free lives. As our pets age they will naturally slow down, but slowing down may also be due to discomfort in the joints. Slowness to rise from lying down, reluctance to get up off the bed or jump on the couch may all be early signs of arthritis and warrant a check up with the vet or animal physio. If your dog has an actual lameness on one or more limbs then a vet check is essential. If your dog has had a joint surgery at some time such as surgery for cruciate disease, medial patella luxation, hip or elbow dysplasia, shoulder instability or OCD, chances are very high, that these joints will have some arthritis as the dog gets older. If your dog was super active as s younger dog, chasing the ball flat out every day, running for long distances or flat out with other dogs at the off leash park, then these are also prime candidates for earlier onset arthritis. So once we have a diagnosis, or even a suspected diagnosis of arthritis, there are many things we can do to keep our dog comfortable, happy and healthy. As an animal physiotherapist, my aim is to maximise longevity and quality of life in dogs. This requires a thorough assessment of the whole dog, their environment and the goals of their owner. Then development of a specific program that meets the needs and fits into the life of the dog and the family. If its not easily achievable then the program wont be followed, but if we want to make a difference to our dog’s life, there has to be some level of commitment to them as owners of these valued companions – you may have to put some effort in, but hey aren’t they worth it? In my clinic, we discuss and address each of these principles for each individual patient. Check out these principles below – many you can easily apply straight away. Trying to reduce activity or exercise that impacts the joints will reduce the chance of them being aggravated. 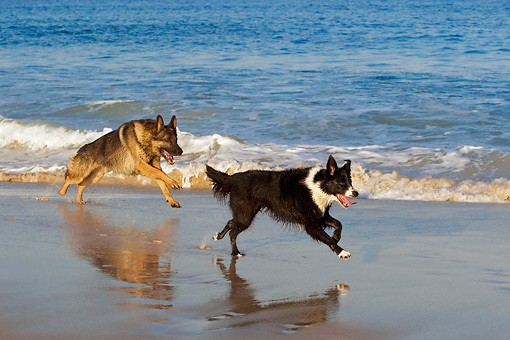 Dogs are really poor at self limiting – they will keep running even if the joints are sore. Walking and trotting on the leash are typically quite safe exercises but if your dog likes to run madly around off leash chasing the ball or other dogs, then the repeated twisting, turning and sudden stopping and starting may make the joints sore and inflamed. But if you think your dog would really miss out if you took away the ball chasing or socialising with others, then at least cut these activities significantly down. It really is a balance of activity they really love, versus crippling pain of arthritis that limits their quality of life. Some modification will prolong longevity and quality of life. Exercising in the sand can also be quite stressful for arthritic joints. If you, as the owner, have a sore knee or ankle, or even a sore back, trying walking in the soft sand and you will soon see how difficult it is and how painful your joints can become. If you live near the beach and this is where you walk your dog, at least walk on the firmer sand if possible, and if the sand is always soft, swap some of your dog’s walks to the path or grass to give the joints a rest. If your dog has arthritis in the front limbs, then jumping off the furniture or out of the car on a regular basis can flare up these arthritic joints. The same stresses are experienced with running downstairs. Either prevent this from occurring, or use a ramp or pet-steps and assist your dog wherever possible. Use of a harness such as a ‘Help em Up’ Harness makes life easier for both you and your dog for in and out of the car, and for assisting your dog to get up if this is a real struggle for them. If the hind limbs joints are affected it’s the reverse: try to avoid the jumping up on the furniture or into the car, and racing up a staircase. I once had a patient – a boxer – with moderate elbow arthritis. No medication from the vet would help and the owner was very distressed at his dog’s continual lameness and inability to exercise without pain On questioning, it was discovered she went to and from work each day in the owner’s ute and jumped in and out of the back twice a day. We eliminated this by adding a ramp and voilà… lameness resolved. Try to avoid the ‘weekend warrior’: 10 minutes per day during the week and 1 hour per day on the weekend if the joints are arthritic. This can really flare them up quickly. Moderation and regularity are the key. A couple of shorter walks per day of 20 minutes duration will also be easier on the joints than a 40 minute walk, if you can fit this into your schedule. Swimming is a great alternative to walking and running. 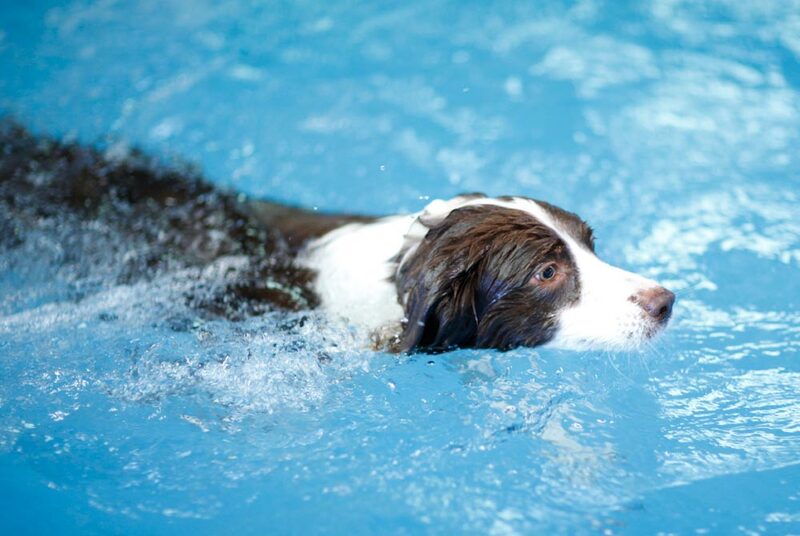 Just like for us humans, using swimming as part of our exercise regime, there are many benefits to be gained from this activity if your dog likes to swim. There is no impact, so for the most part swimming is good for arthritic joints. 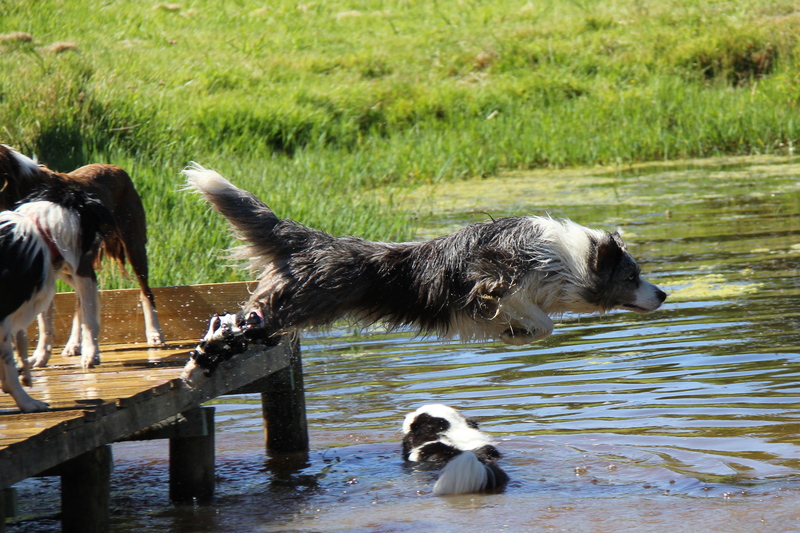 Purpose built dog pools are the best – heated all year round and entry and exits purpose built. Home pools can also be great in warmer weather if you can help your dog safely in and out. Swimming at the beach, dam or lake is also fine if you can limit the running and jumping to get in and out. If your dog likes to chase the ball into the water, then standing knee deep yourself, so your dog remains in the water and swims back to you, rather than getting out of the water and running back in, is much safer for them. Sometimes swimming can flare up arthritic joints. This can be either due to the duration of swimming, or the joints affected. If your dog has severe elbow arthritis then vigorous swimming can sometimes make this worse. So if you plan to try this for your dog, start with a small amount and use a buoyancy vest for support. Then increase slowly each swim session as long as lameness doesn’t increase. For most other types of arthritis swimming is fine. Always fully supervise your dog. If you are swimming in the water with your dog, beware that they may try to swim onto you and scratch you if they are nervous. Use of a harness can assist them in and out, and a buoyancy vest can reduce fear and fatigue, and allow them to swim longer without tiring. Making sure your home and car are set up for your pet with arthritis can also reduce pain and flare ups. Make sure you have non slip flooring for their main traffic area – a runner or several rugs, even yoga mats can make a huge difference to easy of movement about inside your house for arthritis joints, not to mention getting up from the floor. This can prevent not only slipping and injury, but also reduce the need for your dog tensing its muscles around the joints as he tries to cross the slippery floor. If putting rugs and runners down doesn’t suit your decor then your dog could benefit from a great pair or set of 4 Ruffwear boots. For bigger dogs who can still step easily on and off the couch, then making sure there is a non slip rug below is essential. For the little ones, they either need to not jump up and down or buy or make your dog a small ramp or steps to ease the load on the joints. If you have a dog door, then you may need to place a ramp over steps leading to and from the door, and make sure its non slip. You may also even need to increase the size of the dog door if your dog has to really crouch or jump up to get through. This is an essential and often overlooked component of not only management of dogs with arthritis, but for general health and well being of all dogs. Just like us, your dog is going to benefit from a firm supportive mattress that’s easy to get on and off. Many dog beds on the market these days are either like fat cushions with no support, or really thin foam that bottoms out and offers very little support once your dog lies on it. Raised dog beds can also be a challenge for stepping on and off, as well as offering very little support. Certainly not for periods of long rest. Think of sleeping in a hammock or poorly sprung mattress with a sore back- how would you feel if you did this all night? The best test of a bed is for you to kneel on it. If you can feel the ground below then its not supportive enough. Of course your own bed is a great supportive mattress, but your dog needs to be able to get safely on and off. For larger dogs then an inner-sprung cot mattress can be great and easy to place a cot sheet and a mattress protector if needed, over it for easy cleaning. 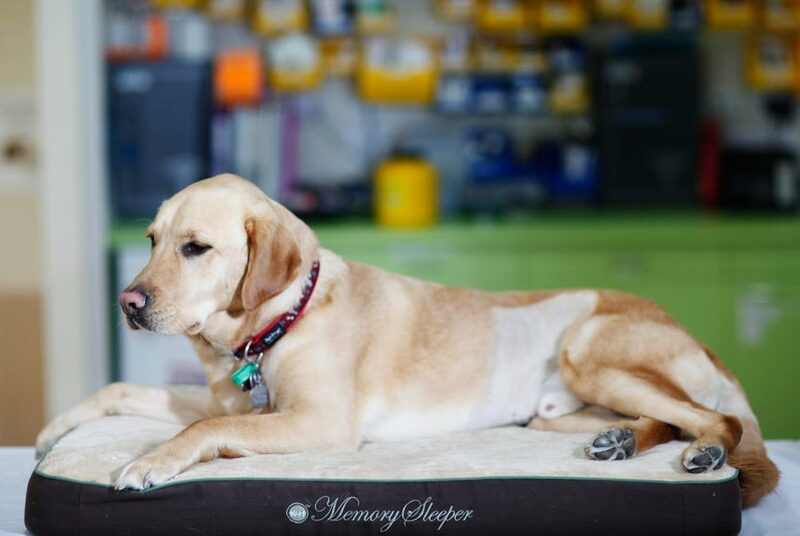 Commercially available memory foam beds such as the Memory Sleeper are also a top quality bed with easy cover removal and come in a range of sizes for all dogs. A good bed ensures joints and muscles are supported and cradled and that your dog can recover during the resting period, and make getting up the next morning easier. If joints are sore, then carrying extra load through being overweight significantly affects not only pain, but contributes to acceleration of deterioration of the arthritis. Weight control in dogs is just the same as in people. In order for weight to be lost, the dog must burn more energy that they consume. 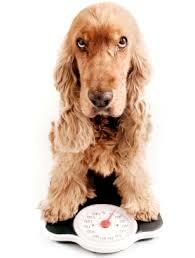 If your dog is not losing weight then they are eating too much for the energy they are burning. You need to alter the balance through reduction in food, or at least fatty food and snacks, and increasing exercise where possible. If exercise is limited by pain, then you could try swimming, or underwater treadmill. It is important to ensure your dog receives good nutrition to assist with reduction in inflammation, along with repair of cells. There are so many differences of opinion on what is the ‘best diet’ for dogs. This may be based on convenience – leading owners to choose pre-packed processed foods, or on recommendation from the vet – if your dog has particular health conditions that require a specific food, or personal choice – leading you to home prepare of cook your food. For me, it makes sense, as it does with us, that minimal processing and fresh and if possible organic ingredients are going to be best. I feed Organic Paws to my dogs and raw meaty bones, chicken wings and necks. Arguments from vets around home-prepared food – which are certainly warranted – are usually based around ensuring the diet is balanced and can meet all the nutritional needs of the dog. Do your research (just as you would for your own diet) – there’s so much information available online. A really great resource is ‘Dr Becker’s Real Food for Healthy Dogs and Cats’. At the end of the day, think about the source of the animals – are they GMO? Were they full of preservatives and chemicals, do we even know this? Do you care? Well that’s it for Part 1 of this Blog Post. Stay tuned for Part 2 next week where I discuss supplements for arthritis, veterinary management, physiotherapy treatment, acupuncture, massage, passive range of motion, mobility aids, heat and ice, rubs and liniments,harnesses and braces. Terrific article Michelle. I have shared it on Facebook! Glad you liked it! Part 2 is on the way! Thanks for such a lovely and detailed post!